The New York Giants were obliterated by the Los Angels Rams on Sunday, losing 51 to 17 at MetLife Stadium in East Rutherford, New Jersey. With the loss, the Giants fell to 1-7 on the season. The game represented the Giants’ worst home defeat since losing by 34 points to the Green Bay Packers in 1998. The 51 points allowed were also the most points the Giants have allowed at home since 1964. The game started off on a rocky note for the Giants. 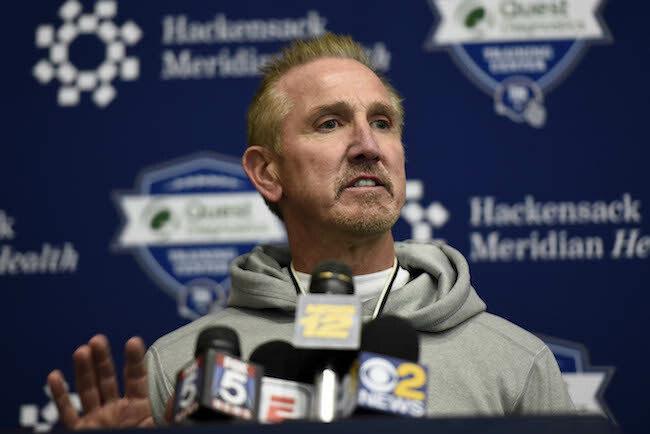 New York received the ball to start the game, drove into Los Angeles territory, but on 3rd-and-9 from the Rams’ 45-yard line, quarterback Eli Manning was sacked and he fumbled the ball away to the Rams. Running back Todd Gurley then gained 36 yards on his first carry and nine yards on his second carry down to the Giants 7-yard line. On 3rd-and-2, quarterback Jared Goff found tight end Tyler Higbee for an 8-yard score. To New York’s credit, the offense immediately responded with an impressive 14-play, 67-yard drive that ended with a 5-yard touchdown pass from Manning to wide receiver Tavarres King. The Giants were 4-of-4 on 3rd-down conversion attempts on this drive. After that 1st-quarter possession, however, the roof collapsed. The Rams responded to the Giants’ sole touchdown drive of the game with a 9-play, 66-yard effort that ended with a 27-yard field goal as the Rams regained the lead 10-7. Four plays later, the Giants turned the football over again when running back Wayne Gallman fumbled the ball away at midfield. The back-breaker came next. Facing 3rd-and-33, the Rams scored off a short screen pass that went for 52 yards and the touchdown. The Rams were now up 17-7. After a three-and-out by the Giants, the Rams took control of the game with a 67-yard deep strike from Goff to wideout Sammy Watkins. Rams 24 – Giants -7. The Giants did chip into that lead on their following possession by picking up 44 yards in eight plays to set up a successful 50-yard field goal by place kicker Aldrick Rosas. And the Giants’ defense finally forced the Rams to punt on their ensuing drive. But the Giants turned the ball over again when Manning’s pass intended for wide receiver Roger Lewis was intercepted at the Giants’ 30-yard line. The Rams did not pick up a first down but extended their lead with a 46-yard field goal. The Giants had a chance to regain those points right before halftime, but Rosas missed a 45-yard field goal as time expired. 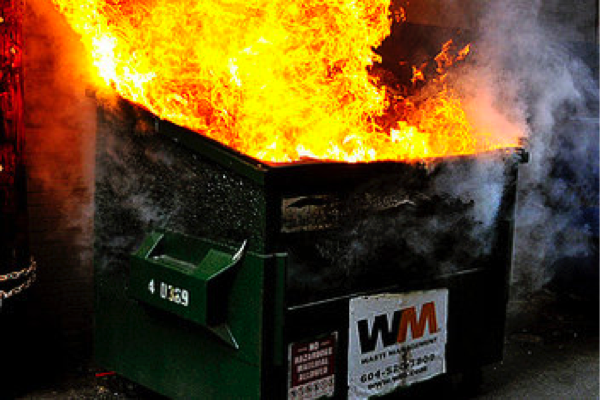 If the first half was bad for the Giants, the second half was worse. The Rams scored touchdowns on their first three possessions of the second half, including drives of 75, 45, and 18 yards. On the latter two drives, the Rams benefited from short fields due to a 30-yard punt return and a blocked punt. The Giants’ defense only forced one other punt in the game and also allowed another field goal drive. Meanwhile the Giants offense in the second half consisted of three punts, the blocked punt, and a garbage-time touchdown drive in the 4th quarter when the Giants were trailing 48-10. Offensively, the Giants generated 111 net rushing yards and 208 net passing yards. Manning, who was pulled late in the game for Geno Smith, finished 20-of-36 for 220 yards, 2 touchdowns, and 1 interception. He also fumbled the ball away once. His leading targets were wide receiver Sterling Shepard (5 catches for 70 yards) and tight end Evan Engram (4 catches for 70 yards and a touchdown). Running back Orleans Darkwa was the leading rusher with 16 carries for 71 yards. Defensively, the Giants only forced two punts, did not sack the quarterback, created no turnovers, and allowed 473 total net yards and six touchdowns. Inactive for the game were offensive lineman Justin Pugh (back), defensive end Olivier Vernon (ankle), defensive end Kerry Wynn (knee), linebacker Jonathan Casillas (neck), linebacker B.J. Goodson (ankle), cornerback Donte Deayon (ankle), and quarterback Davis Webb. Linebacker Keenan Robinson suffered a quad injury during the game. The Giants fell to 1-7 overall and 0-4 at home, the first time they have had each of those records since 1980. A 37-yard completion to Sterling Shepard with just over 10 minutes remaining lifted Manning over the 50,000-yard mark for his career. He is the seventh player in NFL history to throw for more than 50,000 yards. The others are Peyton Manning, Brett Favre, Drew Brees, Tom Brady, Dan Marino and John Elway. Manning finished the game with 50,034 yards. He is 1,441 yards behind Elway, who is sixth on the NFL’s career list. Wide receiver Tavarres King (ankle), wide receiver Kevin Snead (lower body), tight end Colin Thompson (appendectomy on Saturday), safety Duke Ihenacho (hamstring), and safety Ryan Murphy (lower body) did not practice. Defensive tackle Robert Thomas (soreness) and linebacker Mark Herzlich (stinger) returned to practice. Thomas was limited. Linebacker Keenan Robinson (concussion protocol) participated in non-contact drills. Wide receiver Kevin Norwood (hip) was carted off of the field during practice. Geno Smith was the #2 quarterback at practice on Sunday. TE Matt LaCosse made a leaping sideline reception on a pass from QB Josh Johnson. WR Brandon Marshall made a very nice reception in the left corner of the end zone despite tight coverage from CB Michael Hunter. But Marshall was ruled out-of-bounds. WR Odell Beckham, Jr. dropped a slant pass. 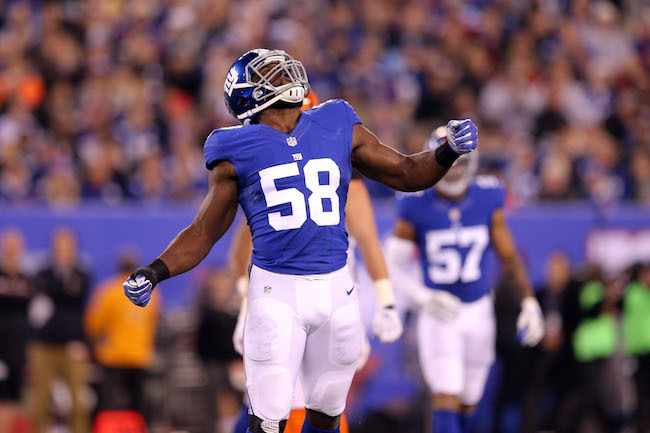 He then made a superb 1-handed touchdown catch on a pass from QB Eli Manning, but Manning would have been sacked on the play by DE Olivier Vernon who got past LT Ereck Flowers. 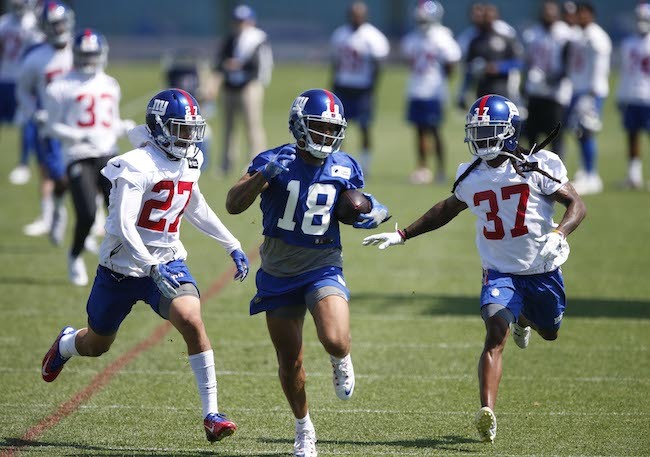 CB Donte Deayon picked off QB Eli Manning’s pass intended for WR Sterling Shepard during the 2-minute drill. QB Geno Smith threw a long seam pass to WR Dwayne Harris between CB Valentino Blake and S Andrew Adams. The 2-minute drive ended inside the 10-yard line with Adams knocking the ball incomplete on diving reception attempt by TE Matt LaCosse. Against a busted coverage, QB Josh Johnson hit TE Matt LaCosse on a slant for a long touchdown. PK Mike Nugent was only 2-for-4 on short-field goal attempts. The thirteenth and final public training camp practice will be held on Monday, starting at 10:55AM. 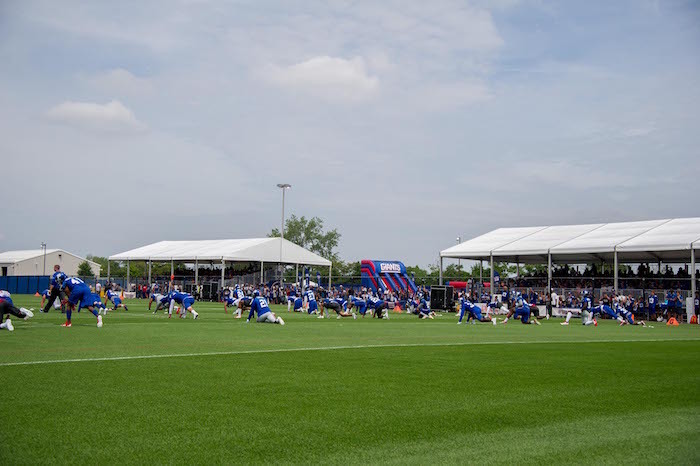 The training camp schedule is available at Giants.com. 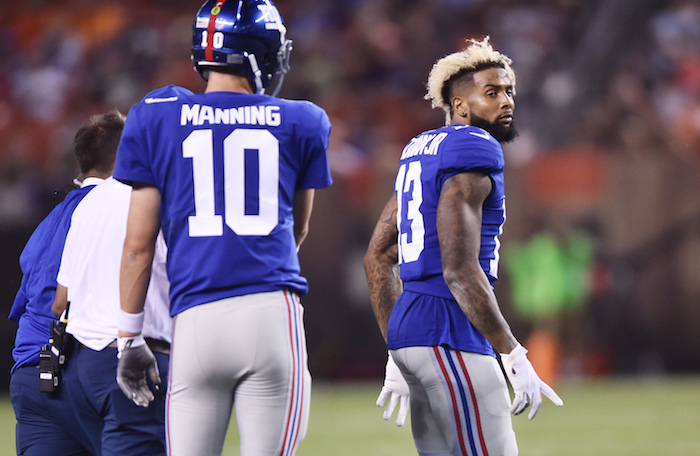 In what amounted to not much more than a glorified scrimmage, the New York Giants fell to the Pittsburgh Steelers 20-12 in the preseason opener for both teams at MetLife Stadium in East Rutherford, New Jersey on Friday night. 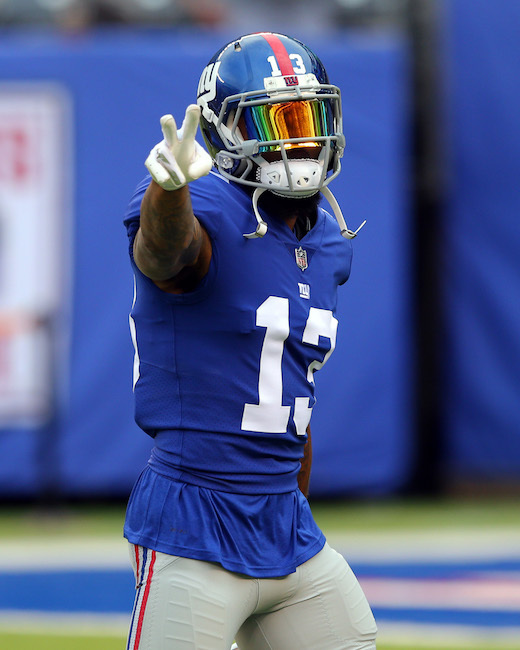 The Giants chose to sit quarterback Eli Manning, wide receiver Odell Beckham, Jr., defensive end Jason Pierre-Paul, and cornerback Dominique Rodgers-Cromartie. The Steelers also did not play quarterback Ben Roethlisberger. Aside for a a couple of breakdowns in the secondary, the Giants defense played well for most of the game, but the offense struggled for most of the night. Pass blocking up front was very shaky and the Giants were unable to consistently run the ball. 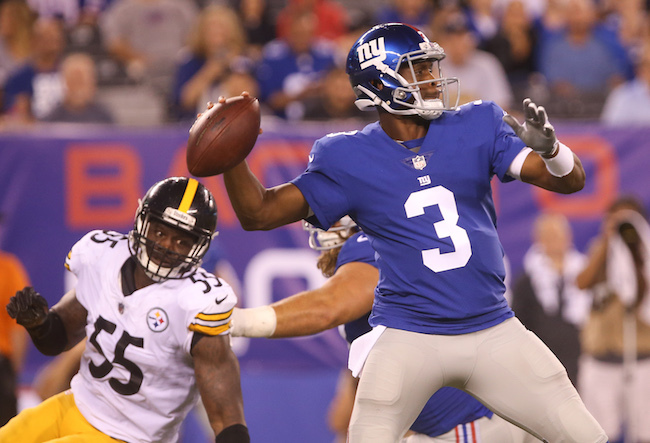 The Giants gave up seven sacks, while sacking Pittsburgh quarterbacks three times. 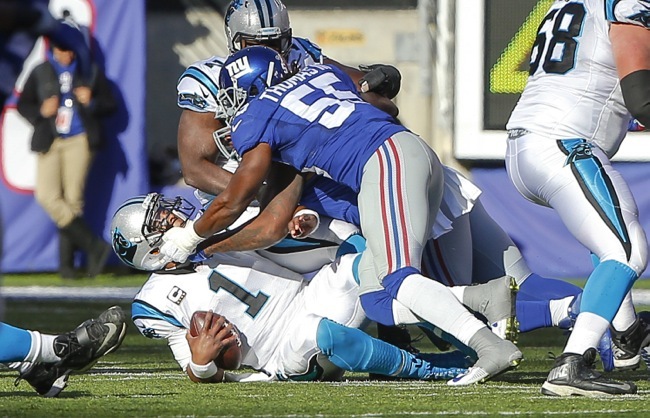 The Giants were held to 242 total net yards (73 rushing, 169 passing) and 19 first downs. The Steelers were held to 226 total net yards (124 rushing, 102 passing) and 10 first downs. Seventy-two of the Steelers 102 passing yards came on two plays, with wide receiver Cobi Hamilton beating cornerback Valentino Blake deep, including once for a touchdown. The Giants also had issues in the red zone (0-for-2) and all of team’s scoring came on field goals. Aldrick Rosas converted on kicks of 27 and 52 yards while Mike Nugent converted on kicks of 30 and 45 yards. Cornerback Donte Deayon muffed a punt, leading to one Steelers’ touchdown right before halftime. All three quarterbacks behind Manning played, including Josh Johnson (5-of-10 for 31 yards), Geno Smith (10-of-16 for 114 yards and one interception), and Davis Webb (8-of-16 for 67 yards). Tight end Jerell Adams was the leading pass receiver with three catches for 28 yards. Running back Orleans Darkwa (3 carries for 18 yards) was the leading rusher. Defensively, safety Landon Collins (5 tackles), defensive tackle Jay Bromley (3 tackles including one short-yardage stop), defensive end Kerry Wynn (3 tackles, 1 sack), and defensive end Delvin Taylor (one interception) all flashed. Not playing in the game were running back Shaun Draughn (PUP – ankle), linebacker J.T. 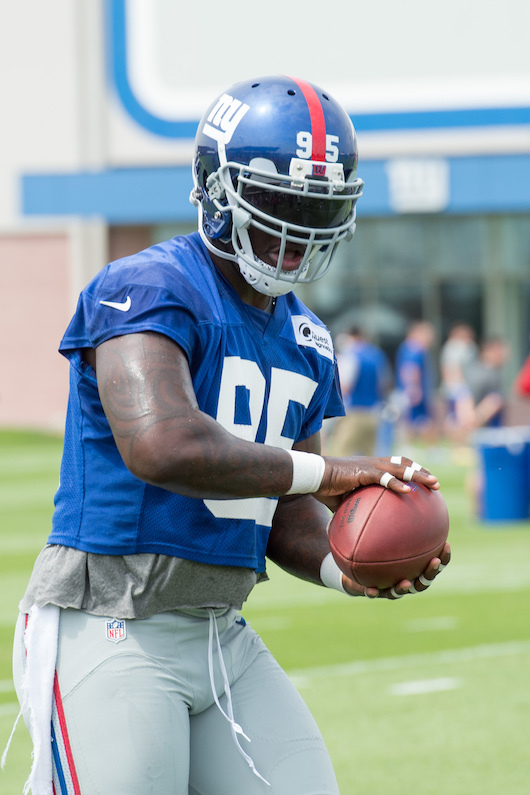 Thomas (PUP- knee), wide receiver Sterling Shepard (ankle), wide receiver Tavarres King (ankle), wide receiver Kevin Snead (lower body), defensive tackle Robert Thomas (“sore”), linebacker Keenan Robinson (concussion protocol), linebacker Mark Herzlich (stinger), and safety Ryan Murphy (lower body). The only player who appeared to get hurt in the game was safety Duke Ihenacho (hamstring).